At RPMC we are excited to announce the release of our newest lidar white paper titled "Single Frequency Fiber Lasers for Doppler Lidar." Doppler lidar takes advantage of the fact that when light interacts with moving object, it experiences a frequency shift. This frequency shift allows you to measure the velocity of both solid objects and to track winds and aerosols. One of the most common uses of Doppler lidar is to determine wind spee d and direction at wind farms, so the blade angle can be adjusted to optimize the efficiency without overloading the turbine. In this article, we will focus on the use of single frequency fiber lasers for an application known as Doppler lidar. After reading this white paper, you will come to understand the fundamentally entangled relationship between the range and velocity resolution of a lidar system and why it is so important to use single frequency laser sources for velocity measurement. This article will further go on to provide a brief overview of fiber laser technology and explain why they have become the light source of choice for most commercial lidar applications. Lastly, in the article, the LRL2 single frequency fiber laser from BKtel is presented as an example of the types of specifications required to lay the foundation for a successful Doppler lidar system. Click below to download the full white paper or see our new White Paper page to browse our ever-growing collection of in-depth articles. 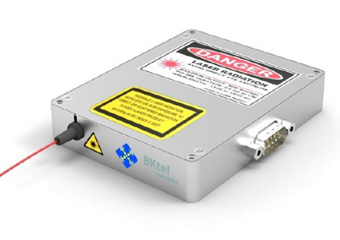 For additional for detailed technical specifications on the LRL2 from BKtel click here or talk to one of our laser experts today by calling 1-636-272-7227.